There are sheep of many different colors and many different kinds of wool. Baa baa black sheep have you any wool? Yes sir, yes sir, three bags full. One for the little boy who lives down the lane. Television shows were not always in color! Find classic black and white television shows or silent films on the internet to show your children. Examples include I Love Lucy, Abbott and Costello, and Charlie Chaplin films. Riddles about black and white animals! 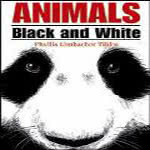 Read Animals Black And White by Phyllis Limbacher. The South Carolina Day by Day Family Literacy Calendar is designed to be a tool that families, caregivers, educators, and librarians can use at home and in the classroom to further develop early literacy skills that help young children become prepared for, and to do better in, school. The Calendar is a project of the South Carolina State Library, working in partnership with many agencies and organizations, and primarily funded by a Library Services and Technology Act grant from the U.S. Institute of Museum and Library Services (IMLS). Copright © 2018. DayByDaySC is a service of the South Carolina State Library and is funded in part by the U.S. Institute of Museum and Library Services. DISCLAIMER: The videos and links on our DayByDaySC.org website are reviewed periodically and are approved as appropriate for children. Through those links, you may be able to go to other websites or videos which are NOT under the control of the South Carolina State Library. We have no control over the nature, content, and availability of those sites. The inclusion of any links does not necessarily imply a recommendation or endorse the views expressed within them.